Make It Count Foundation believes in honoring our heroes and ensuring that their lives are enriched as a result of their sacrifices. Make It Count Foundation is committed to serving our veterans and active duty military here on Long Island who have given so much for us. The main initiative is providing access to safe, medically appropriate and affordable housing renovation solutions to those Veterans and Active Duty Military who need it most as they journey back to civilian life. Through its vast network, Make It Count develops housing projects that allow our hard-working families to better provide for their families and devote their time and energy to prospering in the world. All renovations are at no cost to the veteran or family through the generous support of individuals, foundations, and corporate contributors. 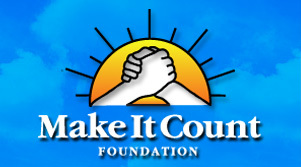 Make It Count Foundation will support individuals and their families who seek understanding and assistance in managing their own health. Additionally we serve to inspire and motivate those on their own personal journey towards a healthy lifestyle in order to achieve their optimal health. Our Bikes for Fitness program distributes bicycles to individuals and families in need helping them on their way to a healthy lifestyle. Make It Count Foundation makes it possible to help people attain a healthy lifestyle though the Bikes For Fitness program. A growing number of local Long Island families struggle to put food on the table and keep a roof over their heads. For them, bicycles are out of the question. We believe biking can be tremendous fun, and if kids and families can get a good bike and a good start in their life biking, it’s great for us to have more cyclists in the community. A bike gives a child freedom and responsibility. Our program mobilizes youth and adults, supports the self-empowerment of individuals and celebrates and builds upon the existing strengths of our partners. Bikes for Fitness Program has enduring impact here in our own neighborhood of Long Island and provides individuals and families in need with a positive, healthy experience. Fitness can come in a variety of ways, but using a bike can also provide a form of fun and entertainment. For many children, the start of a new year is filled with anxiety and academic challenges. Many Long Island children return to school unprepared, lacking the basic supplies they need to succeed. Make It Count Foundation’s Backpacks for Education Program provides children returning to school with the basic supplies to thrive academically. In our concerted effort to improve the scholastic achievement of children throughout our communities, we reach out to our supporters for assistance in supplying needy children with new backpacks filled with the tools necessary to begin the school year on positive footing. Make It Count will provide scholarships and grants to children, which we have identified as in need of these services. Acquiring further education and nurturing the gifts in our children has been widely established as a major component of an individual’s success in life. Academic and extracurricular success not only builds the self-esteem of children, but also ensures that they have the ability to maximize all the opportunities available to them in this world. Make It Count will provide scholarships to young scholars and gifted youth who have not only shown promise in an academic or extracurricular capacity, but who also would otherwise lack access to further growth without this necessary financial assistance. Schools and universities who have identified such children and youth should direct inquiries to: info@makeitcountfoundation.org. Make It Count will provide grants and technical assistance to schools and organizations that work to advance the potential of our future leaders. Make It Count will identify schools and areas that are in need of supplemental programs in the areas of sports, nutrition and self-esteem. In order to build the capacity of current programs and ensure that all children have an equal opportunity, Make It Count will also use its expertise in construction and real estate to help schools expand their current facilities to accommodate the educational and extracurricular needs of its student population.